To honor her grandmother, my friend, Cammie (Carolyn King), designed a stamp set for Gina K. Designs called Whimsical Autumn. 100% of the proceeds from this stamp set will go to the Alzheimer's Association (and the word is, the Alzheimer's Association Board of Directors is matching these donations for the month of September!). But she didn't stop there. Cammie wanted to further honor the caretakers of those with Alzheimer's, so she came up with a plan. Well, this small idea GREW and GREW into something BIG!!! We're talking GINORMOUS here!! She has been holding back until this day, WORLD ALZHEIMER'S DAY, to let the cat out of the bag! I know there is a HUGE and I mean HUGE HUGE HUGE giveaway in which all of our FAVORITE companies and a few of your favorite stampers (wink!!) have generously donated goods in support of this cause. Check out Cammie's blog today to see how YOU can brighten someone's day and enter to WIN this amazing prize (It now stands in excess of $800, plus many PRICELESS gifts)! 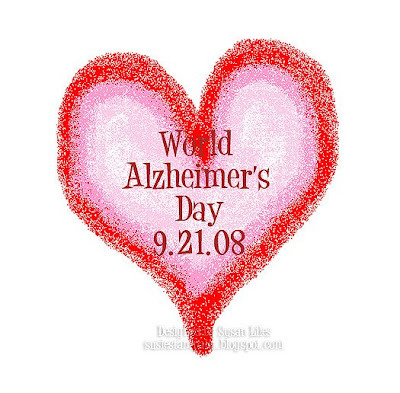 For those of you who know someone or have been touched by a life turned upside down by Alzheimer's, my prayers are with you and your family, especially today. Hi Susan! Follow your blog daily! Just tagged you, visit my blog for the info. Aloha! YAY for spreading the word!